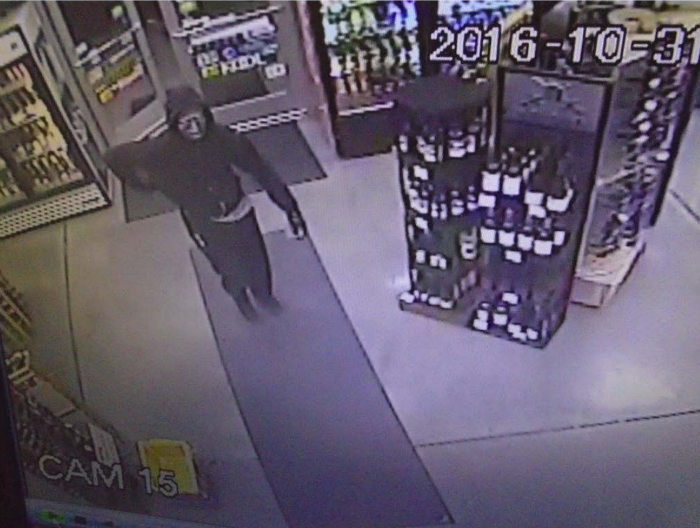 Two nights after a pair of suspects robbed an Atascadero gas station at gunpoint, a man with a pistol robbed a Paso Robles gas station. Early Monday morning, a man wearing a mask and dark clothing entered the Golden Hill Mobile gas station at 2401 Golden Hill Road. The robber demanded money, and the gas station clerk gave him an undisclosed amount of cash from multiple registers, according to a Paso Robles Police Department news release. The suspect then fled north toward a nearby shopping center. Immediately following the robbery, the clerk called 911. Police arrived at the scene around 1:28 a.m., within three minutes of the 911 call. Officers searched the area, but they did not manage to find the suspect. Police describe the suspect as a male adult who is 6 feet tall and weighs 180 to 200 pounds. The robber was wearing all black clothing, gloves and a grey or silver mask. Investigators request that anyone with information about the robbery call the police department or Crime Stoppers at 805-549-STOP. On Friday night, two suspects, one armed with a gun and the other wearing gloves, entered a Chevron gas station on Morro Road in Atascadero. One robber pointed a gun at the clerk while the other demanded money. The suspects then fled the scene on foot with an undisclosed amount of cash. Atascadero police have yet to locate the robbers.